Gov. David Ige signed SB270 into law, which prohibits therapists from offering “sexual orientation change efforts” or “conversion therapy” to patients under the age of 18. Maui Now. The U.S. will continue to confront China’s militarization of manmade islands in the South China Sea, Defense Secretary Jim Mattis said today in Honolulu, arguing that Beijing hasn’t abided by its promise not to put weapons on the Spratly Islands. Associated Press. Defense Secretary Mattis arrives in Honolulu for change at U.S. Pacific Command. Hawaii News Now. SHOPO has endorsed Ernie Martin in the Democratic primary race for Hawaii's 1st Congressional District. Hawaii News Now. Hawaiian Airlines is debuting nonstop daily service starting Thursday between Daniel K. Inouye International Airport and Long Beach Airport. Star-Advertiser. AirAsia to increase flight frequency from Honolulu to Malaysia via Japan. Pacific Business News. A 200-year-old carving of the war god Ku has returned home to Hawaii after spending untold years abroad and in the hands of private collectors. Associated Press. The State Department of Health is fining the developer of the exclusive Olomana Heights project in Kailua $28,000 over allegations of illegal storm water discharges. Hawaii News Now. The University of Hawaii at Manoa announced today that it ranked 306 out of 18,000 universities worldwide in the 2018–19 Center for World University Rankings, the largest academic ranking of global universities. Star-Advertiser. The University of Hawaii at Manoa is now ranked within the top 1.7% of universities worldwide according to the latest academic ranking of global universities. Maui Now. A long-lost World War II aviator soon will be going back to his family for burial after his remains were recovered in 2016 from mountainous terrain near Kahuku Point, and he was positively identified. Star-Advertiser. Lava Crosses Highway 132, Destroys 400 Utility Poles. Power to some areas has been knocked out for the foreseeable future. Associated Press. Lava from fissure 8 severs Highway 132, knocks out power, further isolates lower Puna. Tribune-Herald. On a day when new Hawaii island communities lost a major highway, electricity and cell service because of expanding lava flows, Mayor Harry Kim told a gathering that included many of those affected that they will get through this ordeal. Star-Advertiser. Eruption Meeting – Mayor Harry Kim. The mayor said a restricted area will be established in sections of Leilani Estates. No one will be allowed in, according to a new policy. Big Island Video News. Puna residents air concerns over housing, overnight curfews amid ongoing eruptions. Hawaii News Now. Lava flows are threatening several wells at the Puna Geothermal Venture plant, after earlier cutting off the primary access road to the facility. Hawaii News Now. Making a bad situation worse: Lava evacuees are running into rental scams. Hawaii News Now. 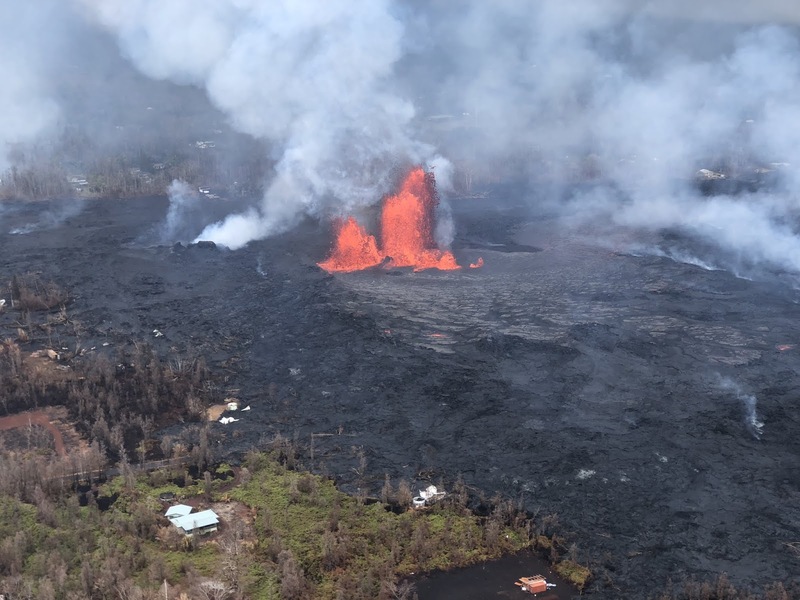 The state Department of Land and Natural Resources is cracking down on lava gawkers who violate closures in disaster areas associated with the current eruption of Kilauea. Star-Advertiser. Three cited by DLNR for lava-related offenses. The state Department of Land and Natural Resources’ Division of Conservation and Resources Enforcement adopted a zero-tolerance policy toward anyone who violates closures in the disaster area associated with the current eruption of Kilauea. Tribune-Herald. A New York state couple was cited after bypassing a security checkpoint in attempts to view an active lava flow Monday evening, state officials confirmed Tuesday. West Hawaii Today. Air quality reaches ‘unhealthy’ levels in Kona. Hualalai was shrouded in vog as air quality reached “unhealthy” levels for some West Hawaii residents Tuesday. West Hawaii Today. The recent eruptions at Kilauea’s east rift zone have sent fine strands of volcanic glass, also known as Pele’s hair, over Pahoa. Hawaii News Now. The Pride of America resumes its weekly Wednesday visit to Kailua-Kona today. Tribune-Herald. Coastal hazards specialist Tara Owens will talk about the impacts of sea level rise at a Maui County Council Planning Committee meeting Thursday. Maui News. Vietnam War Monument unveiled on Memorial Day. Maui News. The Hawaii Board of Agriculture on Tuesday approved parameters for emergency low-interest agricultural loans for farmers suffering damage due to the heavy rain and flooding on Kauai and Oahu in April and the current eruption phase at Kilauea volcano on Hawaii Island. Garden Island. It’s been nearly six weeks since Kauai was hit by record flooding. And the recovery continues to be a slow process. Hawaii Public Radio. Roy Saito has called Kauai home for several decades, but over the years, he’s seen a lot of changes on the island, and that’s why he decided to run for County Council. Garden Island. Starbucks holds racial-bias training for employees. Garden Island.